I highly recommend a visit, and to take your time, to see this exhibition of video, installation, prints and photographs by this Thai artist at the ANU Drill Hall in Canberra. I am not saying that everything about the exhibition is fabulous. The truth is that I had mixed reactions to various works and the curatorial approach taken. But as a whole the exhibition is a definite for anyone who enjoys the experiences of contemporary visual arts. The video of the artist lecturing to dead people was strangely not in High Definition and was not set up to be viewed easily. In the next room, seats had been arranged for people to watch videos for the Two Planet Series. The top photograph belongs to this series and I would like to have seen a couple more of these as well as the four videos. 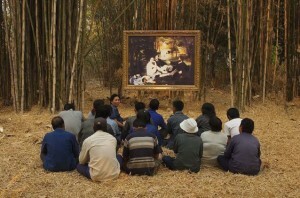 In the Two Planet Series an artwork had been placed out in a field, locals were sat in front and their reactions and conversations had been taped and were now being played back. The novelty of the staged situation caused much smiling. But once you got it, you moved on. The still images were far more engaging and subtle. There were several other videos, two of which occupied whole rooms. The front of the exhibition contained several prints from the artist’s early practice. These were splendid. The ANU Drill Hall is to be congratulated for initiating this exhibition of Araya Rasdjarmrearnsook’s works. I have to admit that I have not recovered from the years through the eighties and nineties when we were flooded with loads of bad video art and I seemed to have spent far too much time watching them all in the hope that something would click and I would understand the works. I am afraid that for most I was not able to get passed the bad production and was always wondering how these visual artists could not see that they had moved into the arena of film makers where production values were important. When I viewed Araya Rasdjarmrearnsook’s work involving the dead people, it was not the subject matter that took my attention. Disappointingly it was the quality of the video and the old monitor that distracted from any attempt to engage with the work. And being set up where it was, you blocked others trying to walk through. Here are few links for background information, but I must emphasise that I do encourage you to visit this exhibition. Want to buy a photograph? – click here.